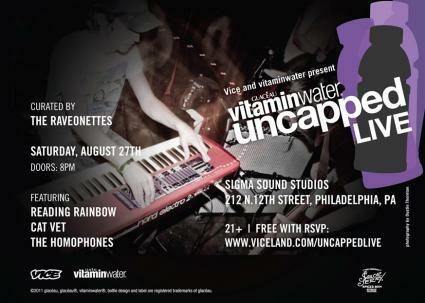 FREE Vice/Vitamin Water Uncapped Live Showcase w/Reading Rainbow, Cat Vet & The Homophones on Aug. 27 at Sigma Sound Studios! There will be a great FREE Vice/Vitamin Water Uncapped Live Showcase on Saturday, August 27 at Sigma Sound Studio featuring Reading Rainbow, Cat Vet, and The Homophones! The evening is curated by The Raveonette. You can RSVP and reserve your spot HERE!